Devoted to Spiritual Science and Philosophy and all Subjects Pertaining to the Welfare and Progress of Humanity / A Magazine Devoted to Spiritual Science and Philosophy as related to Universal Human Progress. San Francisco, CA; Boston, MA; New York, NY; Chicago, IL. Publisher: Unity Publishing Co.; Frank F. Lovell; H.E. Saunders (Chicago). Editor: W.J Colville; Alzire A. Chevailler. 1/1, January 1890-1894(?) 40 pp., 7 x 10. $2.00 a year ("free to those unable to purchase it"). Notable because of the involvement of W.J. Colville as he changed from a spiritualist medium to a new thought occultist. When he began the journal he had just ceased being the business manager of George Chainey and Anna Kimball’s the Gnostic in San Francisco. Noted as a "new" journal in Theosophical Review/Lucifer, April 15, 1890, which says that it "contains papers of interest, especially the editorials and articles on Nationalism. But its notices of ‘Metaphysical’ and ‘Christian Science’ healing, and advertisements about the ‘Summerland’ make it somewhat a mixture." The Christian Metaphysician, September-October 1891, says that: "Its Teachings are Practical and Christly Humanitarian." Mentioned in Catherine Tumber, American feminism and the birth of New Age spirituality : searching for the higher self, 1875-1915 (Lanham , MD: Rowman & Littlefield, 2002), 71, as the work of Chevallier and the old universal reformer Abby Martin Diaz. 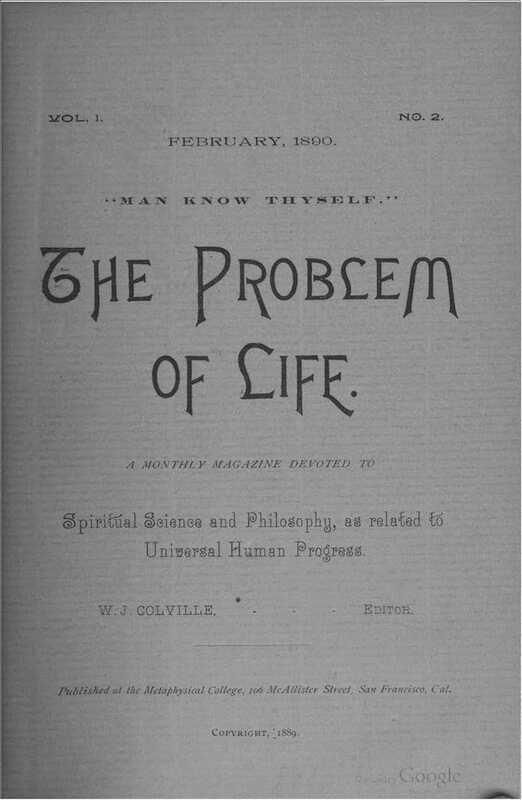 In October 1890, the journal succeeded A.A. Chevaillier’s International Magazine of Truth, which itself was the successor of Mary Plunkett’s International Magazine of Christian Science. Chevallier was instrumental in the downfall of Thomas Lake Harris' west coast operation. The journal in its earliest days noted that it had a "bona fide circulation" of 2,000. NSAC, Lily Dale (1891-1894); Sonoma State University (September and October 1891).